This was where Pattie really had the most fun with her look. During this period, the Beatles and friends were very much interested in Eastern culture – something that was evident in all their wardrobes. Almost every piece in her wardrobe was a multitude of colors or at least a very beautiful, ornate pattern. Her accessories were killer during this time – she had the most beautiful sandals and the greatest stone rings. Hairstyle: Pattie switched between completely grown out hair and her blunt bangs – both of which looked great with her longer hair. 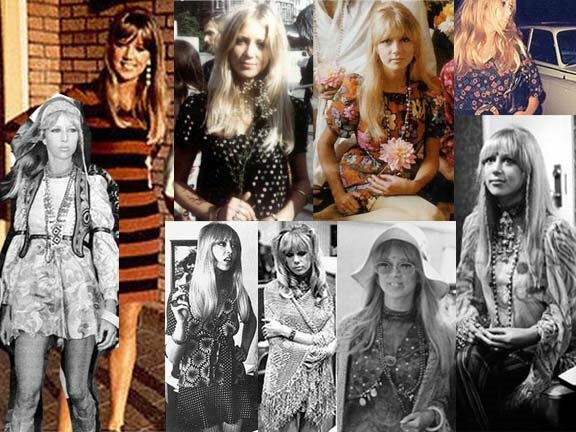 She always parted her hair down the middle and it seems like during this period she lightened her hair from the dark blonde of 1966 to a very light honey color in late 1967.